We have company coming over tonight for a pizza dinner/play date. I made last Friday - when we went to another friend's house for dinner - the easiest dessert ever. 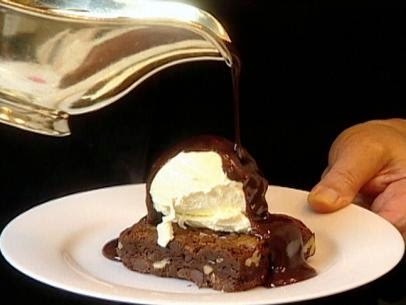 I made the brownies last night so all I have to do is make the chocolate sauce right before serving. Perfect dessert for kids and so easy for entertaining after a workday. I have my fingers crossed for rain tomorrow so soccer is cancelled and I get back 3 hours of time. I still need to finish decorating for Halloween and want to relax and make a nice dinner and chill at home.